A posting on the Animas Center for Coaching, What Is Transformational Coaching, caused me to reflect on various coaching strategies that I practice with different clients to reach identified outcomes. In particular, I pondered if my choices of strategy are conscious vs. unconscious. A performance coach’s main intention is to help the client towards agreed outcomes and to achieve this more efficiently and effectively than if the client didn’t work with the coach. A developmental coach broadens the coaching to explore what learning the client takes from the coaching and the change that takes place. The fundamental intention is to create learning from action. A transformational coach could be said to work “deeper”. Their focus is on helping the client explore the underlying assumptions, beliefs, values, expectations, personal attitudes that shape their experience of themselves, their world and other people. Of course, this is not an unfocused exploration. It starts with the client’s presenting challenge, issue or aspiration but rather than focusing purely on resolving or achieving this, it seeks to explore what is at the heart of this whilst also enabling, where relevant, the achievement of the objectives. 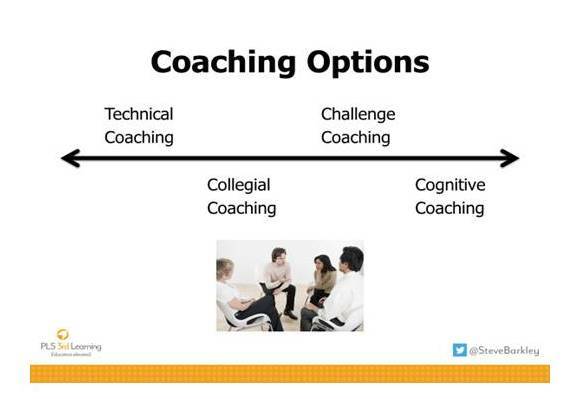 My read is that performance coaching has an alignment with technical coaching. The teacher and coach have identified the teaching skill or strategy chosen to increase student success. The coach’s guidance, modeling and/or feedback assists the teacher in mastering the execution of the practice. 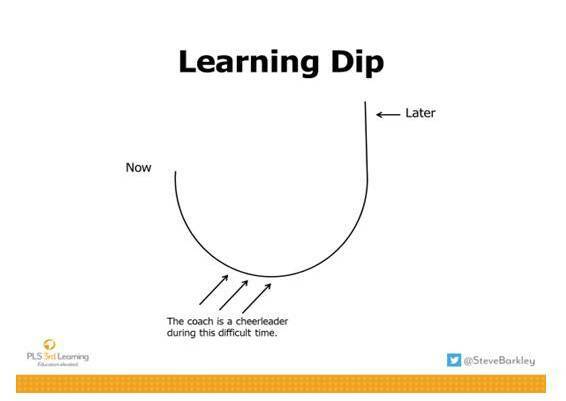 Performance coaching is valuable in creating enough teacher’s conscious practice to process through the learning dip. The initial implementation of a new skill tends to create a decrease in teacher effectiveness. This clumsy, somewhat jerky execution feels uncomfortable to the teacher and often confusing to students as it requires a change in their learning behaviors. Coaches’ encouragement and observations of progress promote the necessary practice repetitions. I think I’ve experienced developmental coaching when I find the teacher making decisions about actions or reaching insights about teaching and learning from the observational data I collected and the questions I’ve posed. In theses conferences an idea of “what to do” emerges from the conversation. I am always shocked when the teacher wants to give credit for the idea to the coach. Often when this occurs in a modeling activity during training, participants comment about my skill in getting the teacher to reach the “solution” I had in mind. They are surprised to learn that I had no idea or plan in mind. As I read more on transformational coaching, I am connecting with my practice of seeking an understanding of the beliefs and values underlying a teacher’s actions and decisions. I keep in mind and repeat in trainings that I want to know what the teacher thinks, before I share my thinking. As a starter I frequently probe the teacher’s thoughts on district curriculum, program or practices. I note that ‘morning meeting’ has been implemented school-wide. Is that a process you would have in place even if it were not a school-wide program? Why? How has the district’s implementation of PBL impacted your teaching? Explore the individual’s beliefs, behaviors, and being. Non-judgmental questioning and listening are critical. Address the institutions and systems in which the client works. Teachers are encouraged to think through desired changes in relationship to other school personnel. Are others part of the solution thus impacting a greater student population? Consider the broader educational and social system in which we live. What socioeconomic and political issues impact students and schools? Aguilar reinforces that to be an effective coach I need to be engaged in my own transformation. That is challenging and exciting! Thank you for this post. I often find it difficult to feel like I am really helping a teacher if I don’t have all the answers or the formula to make it work.